David Crosby’s ramblings between songs during the Byrds’ set at the Monterey Pop Festival on June 17, 1967, have become the stuff of legend. As bandmates Roger McGuinn, Chris Hillman and Michael Clarke listened very bemusedly, Crosby talked into the microphone at length about such topics as sanctioned drug use and the John F. Kennedy assassination. Probably not coincidentally, Crosby was an ex-Byrd a couple of months later. 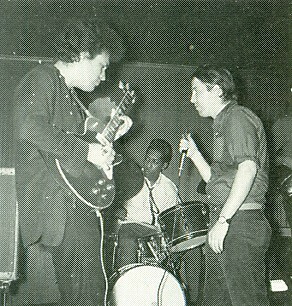 Man, if you didn’t hear Mike Bloomfield’s group, man, you are out of it, so far out of it. The group in question, the Electric Flag, had performed earlier in the day, making its live debut, in fact. And much of the attention at Monterey was focused on Bloomfield, whose instrumental prowess had won him acclaim as perhaps the most highly regarded guitarist in rock music at the time. Perhaps the performances of the likes of Jimi Hendrix and Pete Townshend (and to some degree, Jerry Garcia) the following night opened some eyes to the next wave of guitar stars. But as of Crosby’s proclamation, Michael Bloomfield was at the top of the pyramid. He continues to be widely respected decades after his death on Feb. 15, 1981. Rolling Stone has ranked him as high as No. 22 on its periodic, and extremely fluid, lists of all-time greatest guitarists. But his impact in the pre-Hendrix days seems to be little remembered. As a teenager, Bloomfield already showed enough talent – and balls! – to walk onstage and play with many of Chicago’s top blues acts. After recording some sessions for Columbia Records in 1964, he joined the Paul Butterfield Blues Band, which was among the first American groups to combine the blues with the harder edge of rock. Butterfield and company, including second guitarist Elvin Bishop, quickly became a top national draw with its exhilarating live performances, and the band’s first album, “The Paul Butterfield Blues Band,” released in 1965, is considered a cornerstone of blues-rock. Bloomfield, who’d grown up as a blues player, meanwhile was exploring other influences, including jazz and especially Eastern modal music. The latter – along with a dose of LSD, according to music critic and author Dave Marsh – inspired Bloomfield to compose what became the title track of the Butterfield Blues Band’s second album. “East-West” is one of two instrumentals that take up roughly half the album’s playing time and went a long way toward establishing Butterfield and company as pioneers in exploring the possibilities of rock music. The rhythm section of bass player Jerome Arnold and Billy Davenport, the supporting instrumentation of keyboard player Mark Naftalin and guitarist Elvin Bishop, and Butterfield’s powerful, foghorn-like harmonica all build a solid foundation for extensive jamming. Then there’s Bloomfield’s guitar, which really carries the proceedings into previously uncharted territory. The band’s cover of cornetist Nat Adderley’s “Work Song,” which wraps up Side One of the LP, represents an early foray into jazz-rock, for the most part following the standard hard-bop version until Bloomfield begins his solo, building the intensity as he shows off his fluid playing, transforming the easy-paced tune into a virtuoso guitar showcase. Prior to the release of “East-West” in August 1966, few rock songs had ventured past the four-minute mark by anyone who was not Bob Dylan, Frank Zappa or the Rolling Stones. And none of their material sounded anything like “East-West,” the composition: 13 minutes of mind-melting intensity, courtesy of Mr. Bloomfield’s guitar. He set the stage for extended rock instrumentals, but few, if any, ever matched what he and the Butterfield band put on record. “East-West” is built on a modal format, eschewing chord changes to give the soloists a platform for jamming, as grandly exhibited with Miles Davis’ landmark “Kind of Blue” and subsequent work by Davis’ tenor sax player at the time, John Coltrane. The theme is introduced by the band, with Bishop contributing a spirited guitar line to start proceedings, demonstrating him to be quite a capable instrumentalist, even as a bandmate of Bloomfield. After about a minute and a half, Butterfield joins in on harmonica, doing a creditable job with his lung power of making his instrument the aural equivalent of an amplified electric guitar. The band chugs along behind him, bringing proceedings to a an early climax shortly before the 3-minute mark. Then it’s Bloomfield’s turn. The title of “East-West” comes from his combining musical styles from different sides of the globe, and his “East” portion features a minor-scale counterpoint to the modal D, with Bishop eventually joining him as Butterfield and Naftalin help create a wall of sound leading up to an abrupt change in the action. At 08:32 Bloomfield introduces the now-familiar Motive A, a four-note scaler run consisting of D-E-F-F#, and creates from it a marvelous compound phrase that twists and turns for a full 60 seconds, only resolving back to D some 40 bars later at 09:38. It’s no overstatement to assert that the coherence, clarity and Bach-like motion of this passage, “the 40-bar phrase,” establish Michael Bloomfield as one of rock’s greatest soloists. Certainly no one else before him had exhibited such musical virtuosity. Bishop again helps provide a stunning dual-guitar attack as the song reaches its conclusion, the band breaking into a punctuated, bluesy rhythm that wraps up with an extended final note, with a quick Butterfield harp flourish serving as the final note. Unfortunately, that also served as Bloomfield’s finale with Butterfield as far as studio recordings. He left the band the following spring to embark on the Electric Flag project, and later he worked on the well-regarded “Super Session” album. After a so-so venture as one of Columbia Records’ featured solo artist and a brief Electric Flag reunion, Bloomfield released a number of uneven albums, the last being “Crusin’ For A Brusin’,” which came out on John Fahey’s Takoma label shortly before Bloomfield was found dead in his car in San Francisco. If you’ve never heard him play, find his CDs and listen. Michael Bloomfield was an exceptional musician. He was also intelligent, mischievous, curious, crazy and a whole lot of sweetness. I was lucky to know him. The other half of the “East-West” album contains more stellar examples of the Butterfield band’s groundbreaking forays into blues-rock, including a definitive reading of Robert Johnson’s “Walkin’ Blues” and a cover of Michael Nesmith’s “Mary Mary,” before he did his own version with the Monkees. Also featured is Allen Toussaint’s “Get Out of My Life Woman,” which the band had issued as its debut single the previous year. The songs with vocals make for good listening, certainly. But if you enjoy rock instrumentals, “East-West” is a must.